The Blenheim oval and the Regent round sets are the largest of the 8 seaters. They will comfortably take 8 chairs and are even suitable for 10. The rectangular shaped Sandringham is a very generous size and shape. The smaller Countess or Marlborough are ideal if you are only going to be 8 people on the odd occasion. 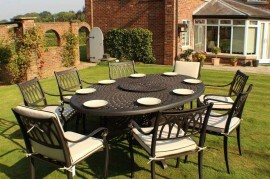 Regent – A large round table with inset lazy Susan. Normal price £1990. Reduced to £1695 INCLUDING cushions. Details A large circular table with integral lazy susan Table dimensions: 180cm diameter ..
Blenheim – A large oval table with optional Lazy Susan. Normal price £1990. Reduced to £1675 including cushions. 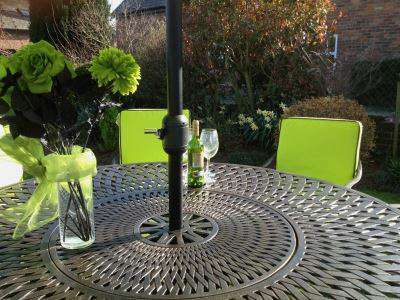 Details Table dimensions: 220cm x 155cm Chair dimensions: 48cm dep..
Sandringham - Premium. Normal price £1749. Reduced to £1375 INCLUDING cushions. 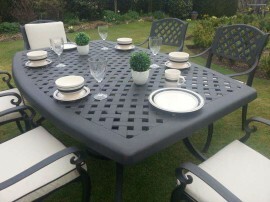 Details A large rectangular table, with an attractive lattice design and bevelled edges Table dimensions: 180..
Countess – A medium sized oval table to seat 6 - 8 people Normal price £1639. 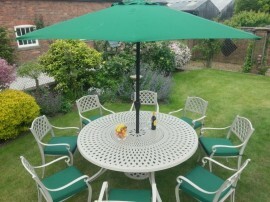 Reduced to £1325 INCLUDING cushions Details An oval table with an attractive lattice design; a very popular size and shape Table dimensions: 180cm x 1..
Marlborough – A medium sized round table with inset Lazy Susan. Normal price £1599.Reduced to £1375 INCLUDING cushions. Details; A round table with inset lazy Susan Table dimensions: 150cm diameter Chair dimensions: 48cm depth x 52cm width x 90cm height. (No assembly needed) Table weig..